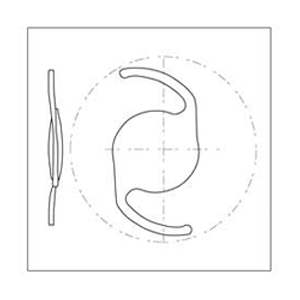 These Hydrophilic foldable IOLs (FH 202s) require smaller incision size for their insertion. Smaller incisions produce less astigmatism; allow quicker visual rehabilitation with stable refraction after a couple of weeks compared to six – eight weeks for larger wounds. The lenses possess full 360 degree sharp edge in order to assist in reducing the incidence of posterior capsule opacification (PCO). The IOL positioning hook may become caught or jammed in a positioning hole (this is not possible with gusset dialing). In the case of unintentional asymmetric lens fixation due to poor lens design or surgical complication the periphery of the IOL may be visible in the pupil. This may occur particularly if the pupil is enlarged, fixed or distorted. In these cases, positioning holes may cause visual symptoms including flare, glare sensitivity, image distortion or multiple images. The presence of positioning holes may provide a nidus for physical contaminants and bacteria. Inflammation and infection may result. Poorly finished positioning holes with sharp or unpolished edges may also cause tissue chaffing or promote inflammation in either the anterior or posterior segment of the eye. The design of our IOLs and their high quality surface finish help reduce the incidence of posterior capsule opacification. Fred Hollows IOLs are made of clinical grade Perspex CQUV. This and their design & finish ensure that the outcome for YAG capsulotomy will be comparable with, or better than, other posterior chamber IOLs. Our single piece technology provides the most flexible haptics to facilitate easy insertion and rapid centration. They are lathe cut to computer controlled parameters, polished using revolutionary polishing system that guarantees the very best surface and edge finish available. Lenses are quality control tested during each phase of manufacture and ethylene oxide & steam sterilized to ensure a product of the highest quality and efficacy. The Hydrophilic Foldable IOLs are packed with or without the Flexiject disposable IOL delivery system.